Need fabric? 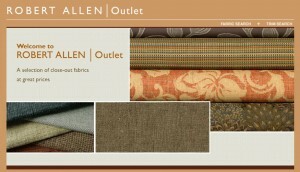 Now is a great time to check out the Robert Allen Outlet. From now through September 3, 2012, you can take an additional 25% off any designer fabric or trim already at clearance prices on the Robert Allen Outlet site! Simply use the code OUTLETSUMMER during the checkout process to receive your additional discount. You will find more about the Robert Allen fabric outlet in a previous article, found here. What will you be making with your fabric purchase? ← What Is the Hand of a Fabric?